Level Up Your PR Game with a complete day of professional development. Three great PR events in one day! 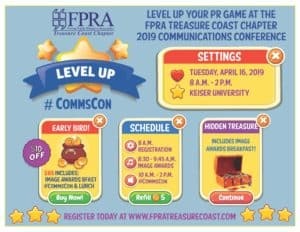 FPRA Image Awards Presentation, Communicator of the Year Ceremony, and Communications Conference will Level Up Your PR Game as the best experience of the year. Take advantage of Early Bird pricing for the best value. ALL EVENT ACCESS for Members and Non-Members for $65. Price includes Image Awards, Plated Breakfast, Communications Conference and Boxed Lunch. But hurry, Early Bird expires Friday, March 15th! Communications Conference Confirmed Speakers – More to come! The Chapter’s Annual Image Awards and Communicator of the Year Ceremony recognize the talent and accomplishments of our chapter members and local public relations and media professionals. The event is a highlight of the year for many businesses and organizations that compete for the top honor of the Grand-All Image Award. Alyson Lundell, APR, CPRC, Senior Director, Public Relations Universal Orlando Resort and FPRA state President-Elect will be our Emcee. Help us honor our local award winners. Bring your Boss or Supervisor to share in the camaraderie and celebration of your fellow PR peers. Image Award Breakfast ONLY $25.